Einstein Rings are more than just an incredible novelty. It’s also a very rare phenomenon that can offer insights into dark matter, dark energy, the nature of distant galaxies, and the curvature of the Universe itself. The phenomenon, called gravitational lensing, occurs when a massive galaxy in the foreground bends the light rays from a distant galaxy behind it, in much the same way as a magnifying glass would. When both galaxies are perfectly lined up, the light forms a circle, called an “Einstein ring”, around the foreground galaxy. If another more distant galaxy lies precisely on the same sightline, a second, larger ring will appear. ALMA/Hubble composite image above of the gravitationally lensed galaxy SDP.81. The bright orange central region of the ring (ALMA's highest resolution observation ever) reveals the glowing dust in this distant galaxy. The surrounding lower-resolution portions of the ring trace the millimeter wavelength light emitted by carbon monoxide. 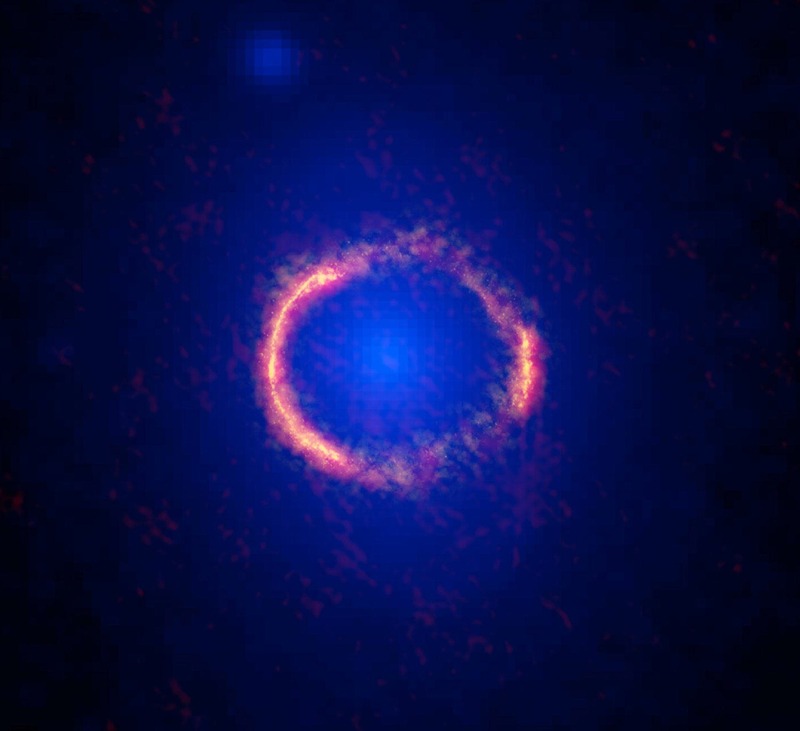 The diffuse blue element at the center of the ring is from the intervening lensing galaxy, as seen with the Hubble Space Telescope. "Gravitational lensing is used in astronomy to study the very distant, very early Universe because it gives even our best telescopes an impressive boost in power," said ALMA Deputy Program Scientist Catherine Vlahakis. "With the astounding level of detail in these new ALMA images, astronomers will now be able to reassemble the information contained in the distorted image we see as a ring and produce a reconstruction of the true image of the distant galaxy." "The exquisite amount of information contained in the ALMA images is incredibly important for our understanding of galaxies in the early Universe," said astronomer Jacqueline Hodge with the National Radio Astronomy Observatory in Charlottesville, Va. "Astronomers use sophisticated computer programs to reconstruct lensed galaxies' true appearance. This unraveling of the bending of light done by the gravitational lens will allow us to study the actual shape and internal motion of this distant galaxy much more clearly than has been possible until now." "It takes a combination of ALMA’s high resolution and high sensitivity to unlock these otherwise hidden details of the early Universe," said ALMA Director Pierre Cox. "These results open a new frontier in astronomy and prove that ALMA can indeed deliver on its promise of transformational science."